CV200-TTX is an Ethernet bridge and E1/T1 converter CSU-DSU. It carries Ethernet traffic over a E1 or T1 network access with clear channel and framed Nx 64 / 56 kbps capabilities. 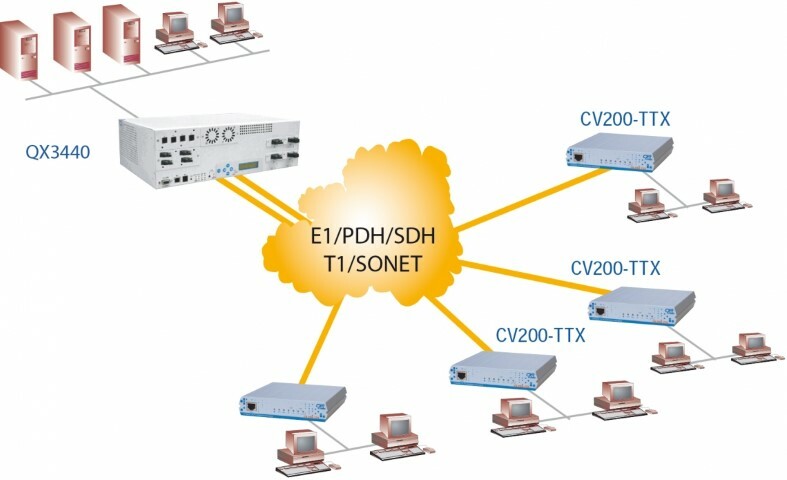 Ethernet frames are encapsulated in a HDLC or PPP-BCP layer that makes it compatible with most E1 and T1 multuplexers. User application data, management and test traffics are isolted into different VLAN's. A compression algorythm raises the Ethernet bandwidth in case of lower speed E1/T1 network availability. CV200-TTX is highly manageable via IP protocols and its E1/T1 interface is adapts to any network requirement. The Auto Link down function can produce a Ethernet link alarm in case of network failure.